← The New Xperf is Here! Xperf (Windows Performance Toolkit, also known as ETW) is a powerful tool for investigating performance issues, however it is a challenging tool to use. Some of this difficulty comes from intrinsic complexity – in order to fully investigate thread scheduling issues, for instance, you need to fully understand the Windows thread scheduler. However much of the difficulty comes from ‘accidental’ or unnecessary complexity, and included in this accidental complexity is the total lack of documentation of summary table columns. The data represented by these columns is very specific and subtle, however the lack of documentation means that a user of xperf must first reverse engineer the column meanings, build up a mental model, and then start analyzing the performance question at hand. In some cases the aspiring performance expert must even figure out the units for the columns! 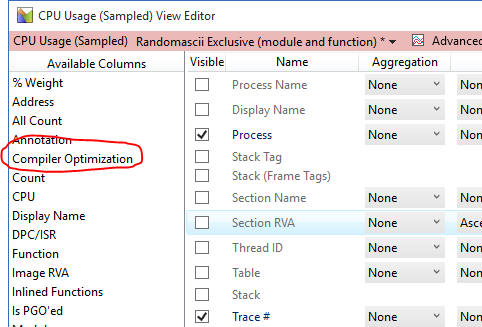 In this post I take on the challenge of documenting the columns for the CPU Usage (Sampled) summary table which displays CPU samples to let you determine where CPU time is spent. Xperf has an excellent sampling based profiler built in. Running at a default rate of 1 KHz (but capable of running at up to 8 KHz – just check Fast sampling in UIforETW) the xperf sampler grabs call stacks from across the system, both kernel and user-mode stacks, with minimal overhead. It is far superior to the many SuspendThread/ResumeThread based systems in various open source projects. UIforETW’s default startup profile shows the CPU Usage (Sampled) data in table form. There is a graph of sampled data available but the CPU Usage (Precise) graph is more accurate than the CPU Usage (Sampled) graph, so I chose to show the precise graph (based on context switches) instead. If you want per-process grouping then hide the Thread ID column. If you want grouping by process name instead of process ID then hide the Process column and show the Process Name column instead. As long as you sort by the Count or Weight (in view) columns the call stacks that consume the most CPU time will be near the top. The inclusive view is most useful for attributing samples by call stacks (who called the expensive function) whereas the exclusive view is most useful for seeing what functions consumed the most CPU time all by themselves. In addition to the column modifications suggested for the inclusive view, it can sometimes be worth adding the Address column to the exclusive view, to see where in a function individual samples hit. As long as you sort by Count or Weight the thread with the most samples will be at the top, with the module with the most samples within that that thread at the top, and so on. There are other variations that can be useful – most summary table questions are answered by saying “arrange the columns like this…” – but they quickly get esoteric. Once you understand the Zen of summary tables you will know when to use them. It is assumed that you have already read the posts explaining how to record a trace and and that you have a trace to investigate. All of the columns in the sampling summary table show data that is related to a particular sample or samples, and the grouping (the columns to the left of the orange bar) affects how many samples and how many rows are displayed. With the default “Randomascii inclusive” view there will be one row for each process, and as you drill down more rows will be revealed. The grouping by stack is particularly important since it lets you see the big picture more easily. Any threads or processes that were not sampled during the visible time period will not show up, even if they did briefly run. The most important columns are typically available by right-clicking on any column header and checking the column of interest. Some of the more esoteric columns (Image RVA, Is PGO’ed, Compiler Optimization) are only available by going to the View Editor in WPA and dragging from the Available Columns along the left to the column on the right. Thread Name, Thread Activity Tag, and have unknown meaning and seem to be unused. This entry was posted in Documentation, Performance, Programming, xperf and tagged CPU sampling, documentation, summary tables, xperf. Bookmark the permalink. to take a sample stack every second to be able to let it run for hours. My assumption was that this would enable me to get a call stack of all processes every 1s. But it appears that only very few processes are profiled by this. I have an issue where a process does hang after 3h for 15 minutes. I have hoped to find out what was going on by using sampling at a very low rate to get the call stacks of all threads in all processes to see where it was hanging. Is this a possible scenario with xperf? An alternate route would be to reconfigure profiling for a short time window to take all CSwitch events and to turn it off after e.g. 1s and to turn it on once every minute. That would also greatly reduce the size of the profiled data. By the way what exactly does COMPACT_CSWITCH drop when combined with CSWITCH which seems to reduce the amount of logged information? I don’t know the difference between CSWITCH and COMPACT_SWITCH. Sampling, at any rate, is statistical, and sampling every second makes it particularly likely that you will miss everything interesting. If a particular process is completely hanging then you should attach a debugger to find out why — that will give you more detail than slow-sampling, including every call stack of every thread in the process. If it’s a busy hang then record a trace — with the normal sampling rate — when it hangs. If it’s an idle hang and you don’t want to use the debugger then try recording a context-switch/ready-thread trace (part of my recommended settings) to get the call stacks of where all of the threads are waiting. From your explanation I see no advantage of recording data for multiple hours. Yes I know that a debugger would be the best option but unfortunately this does happen on a build machine in India. To get the data I have hoped that the easiest way would be to collect a trace of the full build with a very slow sampling rate. Thanks so much for all the great info on xperf. I cannot get stackwalk to work on Windows 2012 no matter what I do; it works great on Windows 7. How can I get this to work??? 2012, or 2012 R2? 2012 is equivalent to Vista, and has ‘problems’. Many people can’t get stack walking to work until Windows 7/2012 R2. 2012 is the one I need right now. I am going to try the win10 version of xperf to see if that helps. I am using WPR to record activities, in my PC i am getting CPU usage sampled in analyser, however in server i am not getting that. Am i doing something wrong? CPU usage sampled is helpful in seeing stacks, where as in server i am capturing and seeing CPU usage precise which does not give me the stack view. Can you please help? I can’t tell. You could try using UIforETW to record the traces, and to view them. Without that I don’t know what recording settings your using, or what viewing settings you are using. That is, it might be that you have somehow done something wrong such that wpr isn’t recording sampled data, or maybe there is something on the server that is preventing sampled data form being recorded (rare but possible), or perhaps sampled data is being recorded but you aren’t configuring WPA to display it.